Kathmandu, put simply, is brilliant. There is so much to see and do you can easily fill ten days, and there seems to be plenty there to suit all tastes, be they trekking, extreme sports, history, haggling, spas or bars there is something for everyone. The valley is a great place to gain an insight into a vastly different culture, often seemingly untouched by western influences, relatively easily. There doesn’t appear to be the same sense of chaos often found in other parts of Asia, but instead a much calmer atmosphere, and one very much able to cope with tourism. 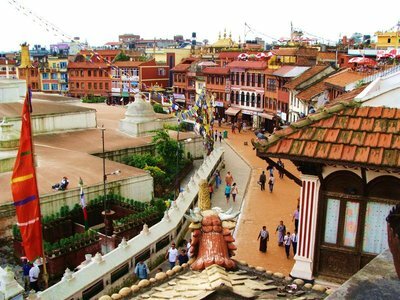 The multitude of sights and sounds, colours and flavours on offer create an exciting playground for foreign visitors to explore and culminate in an unforgettable stay in Kathmandu. Wandering around tourist ghetto Thamel, (and every other attraction of the Kathmandu Valley come to think of it), we are greeted by kitsch Buddhist chanting on a nauseating yet amusing loop, which if nothing else fills the air with a sense of identity far removed from our own. The words 'Om mani padme hum’ and twee tea-field melodies invade us from every corner, forming the anthem of Kathmandu and forever acting as the soundtrack to our stay there. On top of this we are tantalised by a never-ending array of Yak wool delights. Countless blankets big and small and of every colour combination call for our attention with their bold fluffy designs and we can’t help thinking to ourselves “Yes, maybe I could do with one…”. And we are faced with the same feeling in tea houses, trinket shops, paper emporiums and scarf grottos. 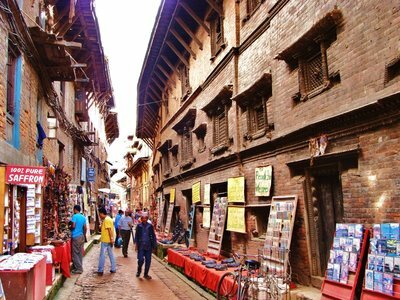 One way or another, having allowed Thamel to work its magic over us, we’ll end up buying something we don’t need. 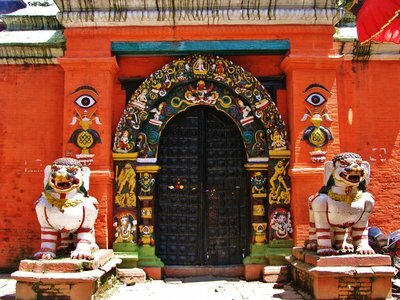 Putting aside the kaleidoscope of shopping, Kathmandu boasts some fantastic cultural sites. Durbar square is like an historical theme park. Once recovered from the extortionate price western visitors have to pay to enter, we are delighted by dramatic Newar attractions. 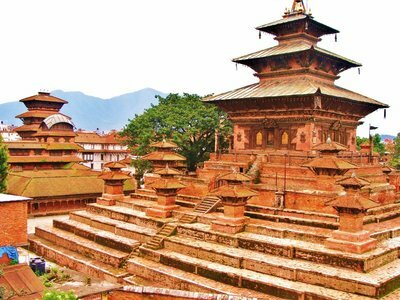 Beautiful pagodas pose for cameras displaying their wonderful spectrum of vivid reds, strange statues of mysterious beings bring a smile to our faces, and dark temples give us a glimpse of a deep and ancient culture. Some visitors are even lucky enough to see the living goddess Kumari who resides in the Kumari Ghar temple. 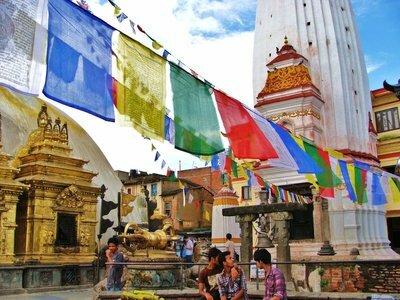 A short walk outside of the city centre leads us to Swayambhunath, one of the most important Buddhist complexes in Nepal and a must for any visit to Kathmandu. The walk up to the stupa is steep, with a seemingly infinite number of steps, but persevering to the summit is certainly rewarded. There we are greeted by a fantastic panorama of the Kathmandu Valley, a vista stretching for miles, embracing city and mountains alike, and apart from that, a truly spectacular religious site. 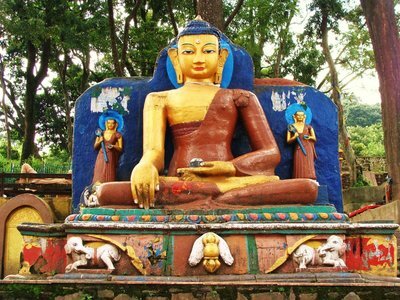 To us western visitors, Swayambhunath seems so magical, so exotic, and so shrouded in mystery. The wonderful colours of the prayer flags dance in the breeze and contrast perfectly against the white body and golden crown of the temple, offering endless picture perfect moments. And as Swayambhu's secretive eyes gaze out across the city we wonder what they may have witnessed in years gone by. 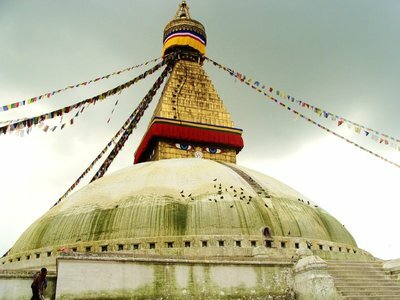 It’s a similar story a short drive from the city centre at Boudhanath stupa, which although does not boast magnificent views of the valley, is this time an even bigger religious landmark. Walking the perimeter of the temple gives you a sense of its dramatic size, truly demonstrating its status as one of the chief Buddhist sites in the world, and as a key centre for Tibetan culture. And as the potent yet sweet scent of incense, the hum of worshipers, and the rhythm of the giant prayer wheel fill the air we can’t help but be enchanted by them. Boudhanath really is a great day trip from Kathmandu. 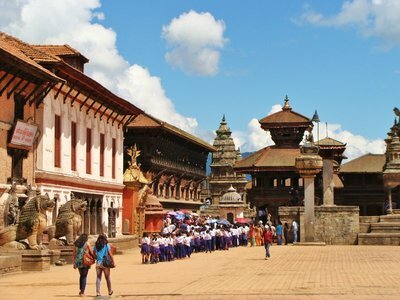 Further afield, the old city state of Bhaktapur is not to be missed. Although, once more, western tourists have to pay a ridiculous amount to be allowed in, it is a brilliant place to visit. Flooded with history it is instantly fascinating from the moment you pass through the city gate. It is full of charming wandering streets filled with stories and marvellous temples whispering of a glorious past. There are four picturesque squares to amuse visitors, each different and engaging in their own way. 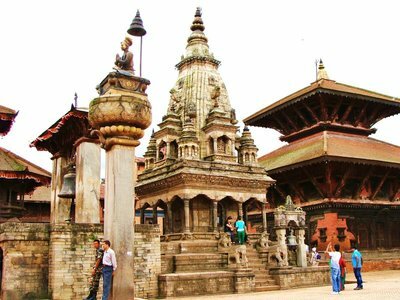 Taumadhi square boasts a tall, charming pagoda that is now a quaint restaurant and a perfect place to pause and take in the lovely atmosphere of Bhaktapur. So, although many may argue that Kathmandu is busy, polluted, prone to powercuts and full of tourist tat, and although that may be somewhat true, I firmly believe that it is an awe-inspiring place to visit. The city itself is able to entertain for days and by venturing just a little further into the valley we are rewarded with truly amazing experiences. Ultimately, the Nepali capital has it all.